Algonquin’s long-awaited follow-up to Breakfast with Buddha–one of our best-loved “word of mouth” bestsellers (with 200,000 copies in print)–finds Otto Ringling and Mongolian monk Volya Rinpoche on another unexpected road trip of discovery. In Roland Merullo’s Breakfast with Buddha an inveterate skeptic and a world-renowned spiritual master set off across America; the Boston Globe raved, “Enlightenment meets On the Road, in this witty, insightful novel.” Now, some eight years later, the world has spun a few times, and what had been certainties in both men’s lives have proved fleeting. Otto’s future is less than clear after the death of his wife, the departure of his children to make their own lives, and the loss of the only remaining structure in his life–his long-held job. For Rinpoche, the changes have been less daunting but nonetheless dramatic, as the encroachment of both technology and daily society threaten the solitude and peace of his North Dakota retreat, and he has been forced to acknowledge (as other good and intelligent people have) that his mysteriously gifted young daughter may be the next Dalai Lama. So Otto and Rinpoche–seeking understanding, insight, and some new road-trip adventures–travel deep into the center of America: to Indian reservations and blighted farming towns, on a hike up the Great Sand Dunes and skinny dipping on the high planes, and from the heart of Colorado’s New Age culture to the classically nonspiritual streets of Las Vegas, where the answer to “What does the future hold?” may be found residing on the top floor of a luxury casino. 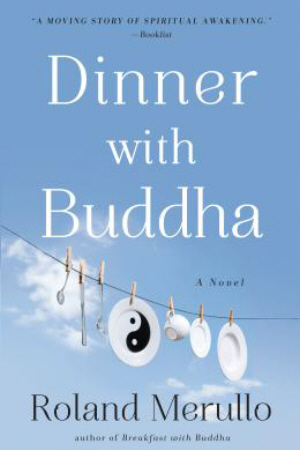 Rich with humor and wise in its commentary on modern American life, Dinner with Buddha takes us along on an exhilarating path to self-discovery with two of the most intriguing men in modern fiction, whose lives seem to be forever entwined.